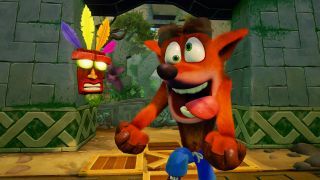 The first three Crash Bandicoot games hold a special place in many original PlayStation owners' hearts - maybe that's why the revamped Crash Bandicoot N. Sane Trilogy was the UK's biggest console exclusive when it launched for PS4 at the end of June. But mounting evidence suggests the nostalgic marsupial platformer may soon come to Xbox One as well. Now, lots of games are built on PC and the colored A, B, X, and Y buttons are more common in that space. So this isn't confirmation of the N. Sane Trilogy being ported. However, Hungarian retailer SuperGamer had an Xbox One version listed (now removed), and Press Start reported in February that the official PlayStation Ireland Twitter account changed its tune to refer to the N. Sane Trilogy as "PlayStation 4 first" (as opposed to PlayStation 4 indefinitely). While this is definitely a rumor, it's one with some jean short-wearing legs.